Industrious co-founder and CEO Jamie Hodari explains what people want in a workplace. Editor’s Note: In this series, The Way We Work, Entrepreneur Associate Editor Lydia Belanger examines how people foster productivity, focus, collaboration, creativity and culture in the workplace. When you think of co-working spaces as a consumer, you might characterize them as places where solitary workers post up with their laptops, a community-oriented alternative to the couch or the neighborhood coffee shop. Sometimes they’re themed: for women, for wellness enthusiasts, for people who work in a specific industry. If you’re a business owner, you might think of them as real estate alternatives to expensive, long-term binding leases. But they’re more than a roof over workers’ heads, explains Jamie Hodari, co-founder and CEO of Industrious, a co-working company with 40 locations across 28 U.S. cities. Industrious, founded in 2013, studies how people work most productively and creatively, as well as the locations, types of buildings and office layouts they gravitate toward. As the company has grown, it’s become a “positive feedback loop” for collecting data about the way people work and refining Industrious locations accordingly, Hodari says. Its member companies include Pinterest, Lyft, Pandora, Pfizer, General Motors, Yelp, Spotify, Hyatt, Chipotle and more. While Hodari has a lot of data, the proprietary data is his “secret sauce.” He has to keep it internal, speaking only in general terms about what he knows or pairing major takeaways with public data. Otherwise, competitors could use it. Despite the imperative to keep his knowledge close to his chest, Hodari spoke with Entrepreneur in general terms about what elements contribute to an optimal work environment -- both indoors and outdoors -- based on what he’s learned from members and partners. Last month, Industrious partnered with retailer L.L. 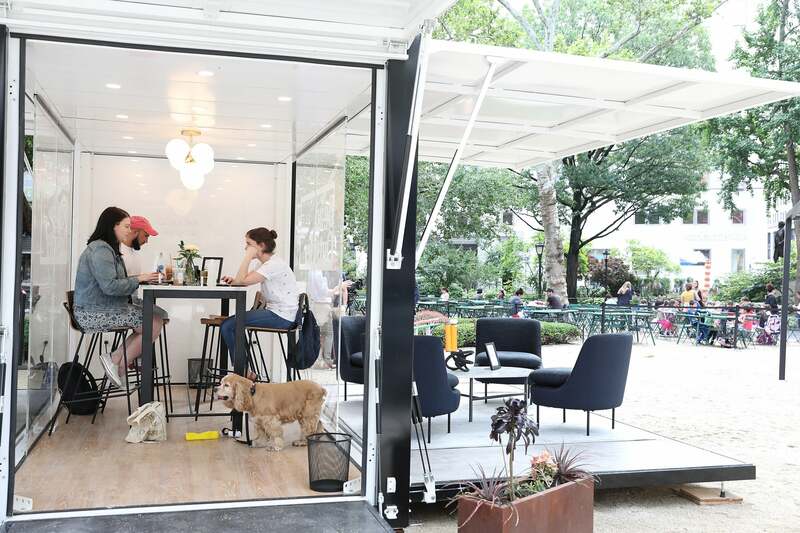 Bean as part of its “Be An Outsider at Work” campaign, which involved a pop-up co-working space in Manhattan’s Madison Square Park, complete with a makeshift conference room in a trailer-like container with transparent walls. In addition to a marketing opportunity, this event was a chance for Hodari to spread Industrious’ data-backed knowledge that being outside benefits workers. L.L.Bean commissioned a survey of indoor workers in conjunction with the campaign and found that 75 percent of respondents rarely or never take time to work outside, while 57 percent spend less than a half hour outside during the work day, despite the fact that the majority of them report that working outside improves their mood, lowers their stress level, relaxes them and makes them happy and healthier. The survey also revealed that people are most likely to take creative work, discussions and brainstorms outside, compared with work that requires a computer or phone. Hodari says Industrious has internal data that complements these findings and gets even more granular. While there isn’t a lot of robust academic data out there regarding the difference between holding formal meetings and brainstorming sessions outside, Industrious can corroborate that in its own findings, exposure to the outdoors fosters creativity more so than productivity. Being outside can help workers “reflect on a complicated business problem,” and even if they spend some time outside, he says, they’re more likely to be more productive once they come back in. Industrious also pays attention to the effects of the indoor environment -- how many feet people in its locations work from a window, how many hours of sunlight they’re exposed to per day, how many plants are in their vicinity and whether their office has an outdoor deck, etc. -- then correlates that information with productivity and happiness levels workers at Industrious locations report. The company is an avid proponent of biophilic design -- the philosophy that indoor plants improve people’s well-being. However, despite persuasion, he notes, some companies still opt out of decking out their Industrious spaces with plants, while others want an abundance of indoor greenery plus easy access to parks. “In most major American cities, it’s going to be something like seven blocks away or less,” Hodari says of park space. But even if you’re near one, will your employees pull away from their desks and go there? “I think one of the easiest things you can do is remind your employees by saying, 'The closest outdoor place to go sit and have a meeting is three minutes away' or 'It’s .2 miles away,'” he says. It doesn’t have to be a city park, per se, but somewhere were an employee feels semi-isolated from the built environment and can comfortably spend some time. Many companies disregard the importance of this proximity, he says. They look at price, first and foremost, as well as the building’s aesthetic. “If I could say one thing to every American company, it would be: Every one of your employees will be happier if you put them within four to five minutes of a park than if you spend up for the building with the big marble lobby,” Hodari says. His research has shown that people report higher levels of happiness and engagement when this is the case. Another preference proven out over the years is proximity to windows within the office. Across the co-working industry, Hodari says, providers determined pricing based on size of office or desk space alone. The offices near the building’s windows were always first to get claimed, and providers adapted to this demand. 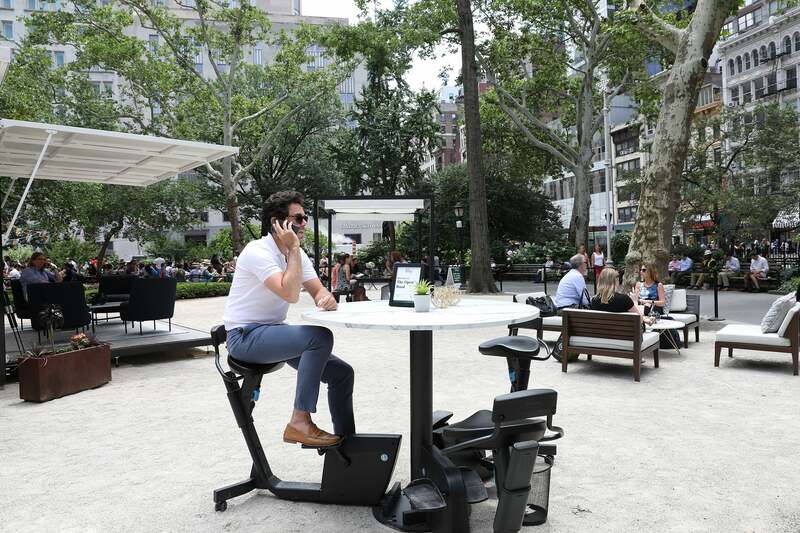 This further adds to the mounting evidence that humans crave a connection to the natural environment during the work day. If he knows one thing for sure, based on Industrious’ research, it’s that workers have their best days at work when they move among “eight to 10” different seating arrangements, even if they’re all within the same office settings. These should be calibrated for a specific type of work, from individual desk space for focused tasks to casual conference rooms for brainstorming sessions or check-ins. Another lesser-known trend Hodari identifies is that many co-working spaces are located on the second or third floor of a building. Gone are the days in which workers glamorized being dozens of stories up in a high-rise, but many landlords assume those lower floors are less popular. “You walk down one flight of stairs and you’re outside, vs. waiting for an elevator for five minutes,” Hodari says of the desirability. “It’s a more human scale. You look out your window and you see real people, not buildings.” Plus, he notes, second and third floors tend to have high ceilings, which is another plus in the eyes of co-working providers and their customers. The way Hodari thinks about these shifts is a trend toward the “humanization” of the workplace. Office furniture often now more closely resembles home furniture, he observes. Many co-working spaces house bars and cafes. Some co-working spaces have even branched out into fitness and “co-living” residential components. As cities continue to evolve, Hodari says he predicts these trends will shape park design. Many parks have gotten a facelift -- New York, for example, has seen previously hectic avenue junctures, such as in Times Square, converted into plazas with ample seating. Don't Understand Blockchain? It Can Work for You Anyway, This Founder Says.